When I posted Work-At-Home Success online, getting search engine ranking wasn’t that hard. Today, it seems like rocket science. I know people who’ve been online for years, as I have, and don’t bother with search engine optimization just because it’s complicated and the rules are always changing. But other online marketers focus solely on SEO, spending money on software or a SEO consultant or service, such as Omega SEO, to continuously monitor and tweak sites to maintain rankings. It’s my opinion that while you don’t want to rely solely on SEO, you don’t want to ignore it either. About 30% of the traffic into Work-At-Home Success comes from search engines, suggesting how important SEO is to a web marketing strategy. So while I don’t spend a great deal of time monitoring my search engine rankings, I do work to make sure my sites are optimized so that search engines can find and rank them. These are the words that your target market uses to search for your products or services online. You use these keywords in the meta tags and content of your site to help search engines index and rank your site. Don’t just rely on your ideas for keywords. 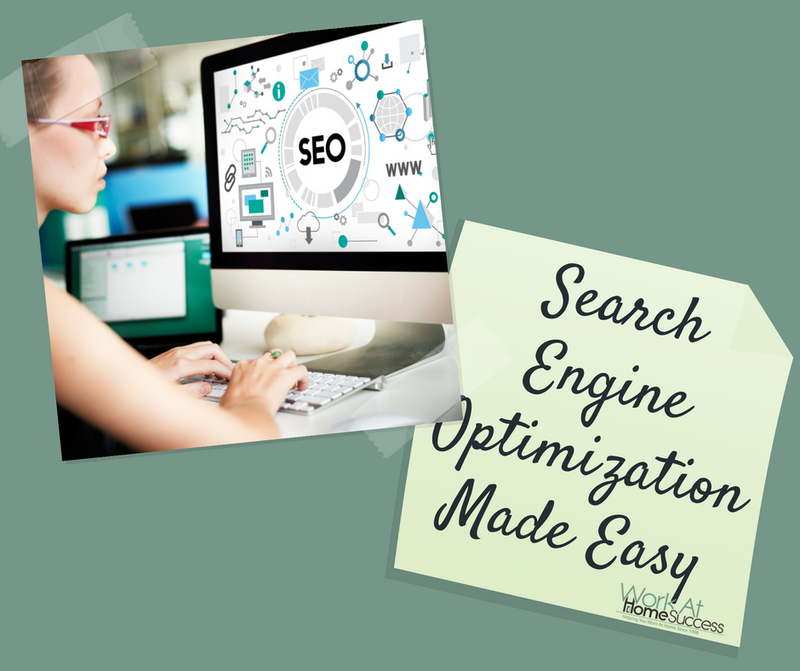 Use a tool such as SEO Book Keyword Tool that will tell you what keywords and phrases web-searchers are using now to find information on your topic. While it would be nice to ranked number one for all your keywords, odds are you won’t. But, you can rank number one for a few and still rank well for others. Meta-tags are hidden code on your website or blog that search engines use to index and list your site. The most common meta-tags for SEO are “Title,” “Keywords,” and “Description.” Each page of your website or blog should have these tags specific to the content of the page. When I first started Work-At-Home Success, all the pages had the same meta tags. Today, each page gets it own title, keywords and description. Your website software should have a feature to let you add meta-tags to your pages. My sites are mostly WordPress with which I use a plugin. Now I use Yoast SEO (paid version) which not only lets me add the keywords and description, but helps offers tips and feedback on ways to improve each post, such as increasing keyword use, or similar articles on the side I should add an internal link to. In the past, I’ve also used All-In-One SEO Pack or Greg’s High Performance SEO, both of which are free. Note that you want your some of your target keywords (those you want to rank for) in your title and description. Search engines also scan your website page to see what keywords are used. To ensure relevance, you want to use your keywords and variations of your keywords without overdoing it. For example, when I’m writing about work-at-home jobs, I also use words like work-from-home jobs, telecommuting jobs or home-based employment. But don’t stuff your content with keywords either or that could hurt your rankings. In most cases, if you write content your visitors want to read, you’ll be using the right words in the right amounts. Be sure to use a keyword in your content title. One way search engines determine if you offer quality content others want to read is to check how many other sites are linking to you. This isn’t just how many sites link to you, but the quality of the sites as well. Further, the search engines want to know what types of sites you’re linking out to. Even when it comes to search engine ranking, the quality of company you keep is important. Google will actually penalize you if there are links to your site on other websites it doesn’t think are a good match. Yikes! Great ways to increase your link popularity are to write articles and guest posts for other websites that target your market. Social media and having your content on other sources (i.e. a Youtube video or a blog comment) helps. Also, check that all the links you post on your site provide the same high quality products or information that you do. Still confused? I believe that if you use the meta tags and offer content people want to read, search engines will find you and like you. Just remember that SEO isn’t something you do once and then forget it. The search engines are constantly finding and ranking new information posted online. To stay at the top, you need to continue to provide quality search engine optimized content. Ever Wondered What A Search Engine Really Is? But if you want to dominate the search engines for ANY GIVEN KEYWORD… you need to find the “KEYWORDS” that “DON’T APPEAR” in your competitor’s “TITTLE & DESCRIPTIONS, H1’s, H2’s & TEXT”. If you can find high volume, high quality “KEYWORDS” that are “NOT” appearing on any other website’s “TITTLE & DESCRIPTIONS, H1’s, H2’s & Rarely in their TEXT”, and you create a page/blog post using these…. BOOM your page will shoot up to the TOP of Google, Yahoo & Bing, as well as all the other search engines. Because we all know they ALL Scrape eack other’s listings, So before you know it…. You’ll be “On Top Of The World! There’s a REALLY AWSOME Suite of SEO Software I use to find High Quality – Under used – Top Quality – Traffic Driving KEYWORDS, but I don’t want to put a link in here, for fear of spamming. But if you want to know what it is…. Email me and I’ll send you the link directly. We all know that there may well be Millions, even Billions of results returned for any given “Search Term”… But most of them are “JUST FLUFF” to fill out the Search Engine’s Results and most of them are NOT optimized in any way, shape or form. So if you can GIVE THE SEARCH ENGINES… What they want; They’ll give you what YOU WANT… A Top Search Engine Ranking… Simples..!!! !